It never ceases to amaze me that leftists generally oppose greedy corporate monopolies running your life for a profit, but have no problem whatsoever with a government bureaucracy managing your medical care with your hard earned tax money. Do they labor under a delusion that a government doesn’t see its citizens as dollar signs while viewing some as productive money whales and others as leeches? The government needs money to pay bureaucrats to handle administrative duties, law enforcement to forcibly instill its edicts, and a whole mess of politicians to write millions of laws the average person can’t understand much less comply with. The government absolutely functions like a corrupt, monopolized corporation with its own police force. If this doesn’t sound like the same kind of giant corporation that the left pretends to oppose, then I don’t know what does. There is a popular belief among many socialists and even some on the so-called “alt-right” that healthcare should be provided free of charge to the people. This idea has many names: “universal healthcare,” “socialized medicine,” “single payer healthcare,”…etc. Just as it has many names, there are many arguments for universal healthcare, though all fundamentally misunderstand private property rights and basic economics. The most prevalent argument is that healthcare is a “human right” or a “positive right.” For example, if I were to say “I have the right to be given a cell phone,” then I would be asserting a positive right to a cell phone. This means someone would be required to build a phone, transport it, activate it, provide line access to cell towers, etc. (Because this would be cumbersome and too obviously resemble slavery, the government instead steals money from its constituents under the banner of “taxation” and pays for such services with this stolen loot) In short, I would be coercively demanding many people serve me and my subjective wants for a cell phone by virtue of my mere existence. On the other hand, if I were to say, “I have the right to buy a cell phone,” I am claiming a negative right. I do not expect the aforementioned services required for that phone to be delivered in working order by virtue of my existence, but rather because the carrier and I engaged in a contractual exchange. For my rights to be respected only requires all other parties abstain from initiating force against me or my property. In order for the positive right of universal health care to be implemented, force must be enacted upon doctors and their staff to compel them to service people. The idea of voluntary and contractual exchange is thereby removed – replaced with a politically charged statist monopoly on health. Not only does this interfere with the rights of doctors and patients to trade and engage in free commerce, it creates serious economic problems. Price inputs are essential to measuring the demand for goods and services. The profit that comes from selling a good or service is not an “evil display of greed” so much as it is a sign that the market favors your product or service more than the sum value of the separate inputs used in its creation. If you make losses, then the inverse is true. Conversely, if you’re making a killing in the market, chances are people enjoy your good or service. Absent profit (a margin of only 3.3% in the insurance industry), accounting for demand is impossible, a situation known as the Misesian calculation problem. One person cannot know how much of a certain good or service will satisfy uneasiness of an entire economic base. For example, how could one person know how many subway sandwiches are consumed and at what price without any sales statistics derived from voluntary patronage? How would they know how much bread to order and how much wheat was needed to make that bread? Not even twenty people could know how much bread should be ordered nor how it should be priced without figures to account for its demand. Absent such figures, wastefully large shortages/surplusses would abound. Why would this economic reality be any different for essential services like those offered by doctors? Absent a profit driven by voluntary patronage (not subsidies, and other forceful wealth redistributions) for their services, doctors would be unable to calculate the genuine demand for their services. A headache which would go away within a day would be treated as equally costly to the individual as a broken arm since he pays the same in taxes regardless of the nature and frequency of his visits to the doctor (under universal healthcare that is). The doctor, unable to properly discriminate against customers using the price mechanism, will be compelled to treat both these ailments at the expense of those which are more urgent. This will invariably lead to rationing and waitlisting implemented by the government in a desperate attempt to damage control the situation. Furthermore, our FDA approves drugs at a much faster rate than that of Canada or Europe. The USFDA actually approves drugs 2 months faster than the EMA or Health Canada, a study by the New England Medical Journal suggests. This would no doubt contribute to the fact that the private healthcare expenditures are higher than the rest of the OECD. The US creates drugs at a quicker rate, so there is more spending. Additionally, the US releases more peer-reviewed publications than any other country on Earth. Data compiled by Forbes from SciVal Analytics showed that in 2009 alone, 40% of all publications in the world came from the United States. 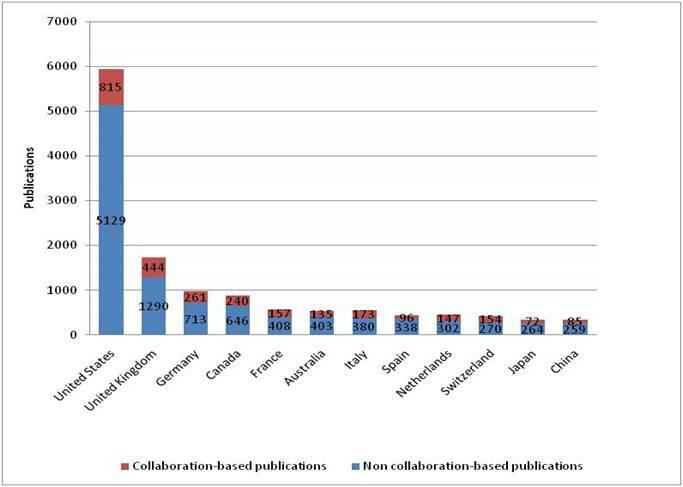 Also indicated is that the US has more total publications than the next 11 countries combined. It’s amazing how much more you spend on healthcare when you’re the lead medical researcher in the world, isn’t it? Universal healthcare is a terrible idea morally, economically, and medically. Anyone who cares for the well-being of society should reject the ridiculous notion that government bureaucrats can be trusted with our health.